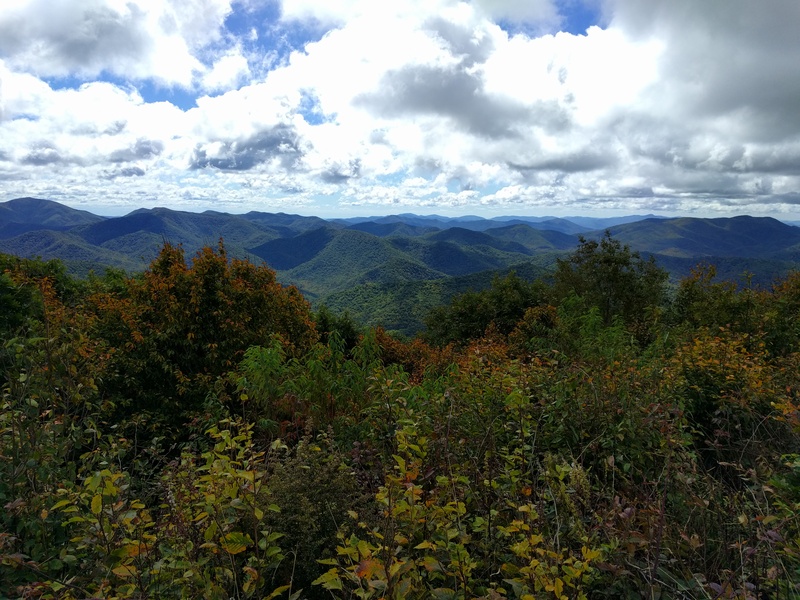 When we planned our hikes for the year, Siler Bald in Franklin, North Carolina was picked for October 8th and 9th. After a quiet hurricane season hurricane Matthew took aim at the east coast as September came to a close. 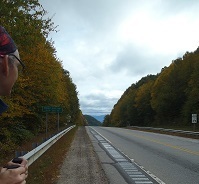 Siler Bald is well inland and we set out under the assumption that the weather would hold. The trail head at Winding Stair gap is just a tiny lot on the side of the road. The wrong side if you want to hike to either Siler Bald or Wayah Bald. You're also in a gap, meaning that the road drops off to either side. So you listen for cars and hustle. I dread the day when electric cars are zooming down this road. The hike heads into the woods with a slight incline to a slick wooden bridge. Fortunately the N.C. AT trail maintainers covered it with galvanized hardware cloth (think metal screen with 1/2" grid). This beautiful open begins a trip that does not disappoint. You are rewarded with the verdant flora that the Appalachians are renowned for as you travel up many switchbacks and through Swinging Lick Gap (who named Swinging Lick gap, and ... WHY??) and Panther Gap. 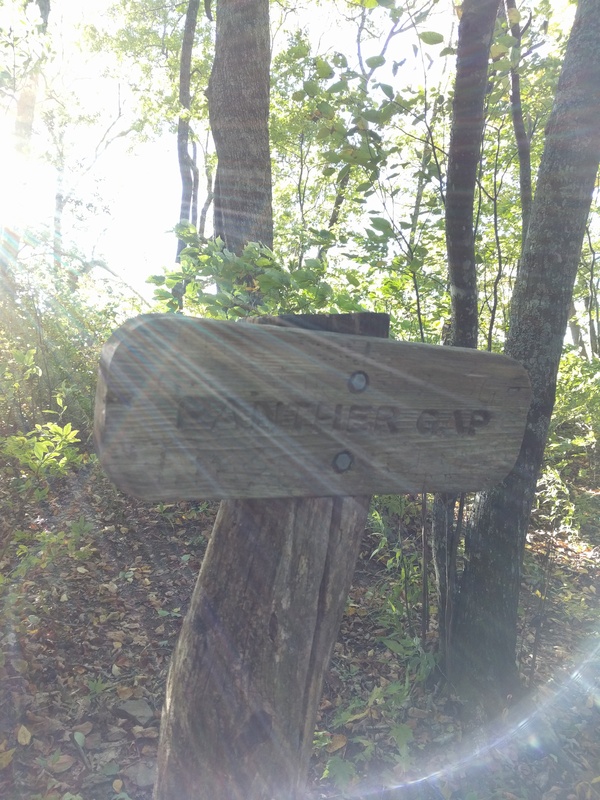 Panther Gap is a good place to stop if you need a breather as it is a seldom used campsite with ample seating and space off the trail so that you don't block traffic. I suspect it is actually never used outside of peak AT season. From Panther Gap you soon begin the last series of switchbacks up to the field that marks the split from the AT. The Appalachian Trail continues towards Wayah and a side trail turns steeply uphill to Siler Bald. 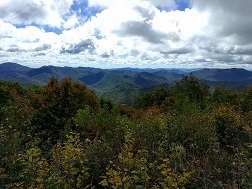 As it was only four miles to Siler Bald from Winding Stair Gap we arrived at the top in time for lunch. The lady foxes broke into their PB&J sammiches while I chatted with a SOBO (Southbound AT thru hiker) we met at the top and enjoyed the view that we came for. With a height of 5,216 ft. and a top that is 90% clear, you are afforded truly amazing views. The brisk wind and clear air from Matthew gave us the best views we've had on Siler. Later that evening we were also treated to the best sunset I have ever seen in my life. We were busy watching and photographing interesting color effects on the south view when a boy scout troop our attention, and thank goodness they did as to the west was the most spectacularly red sunset I have ever seen. While we have photos, I am not posting those because they didn't come close to capturing the effect (I probably needed a tripod, uv filters, and a much better camera). Due to the atmospheric particles kicked up from Matthews the sun turned deep dark red with a large red glow surrounding it. It was the closest thing I've seen to a real life Eye of Sauron (without the creepy cat eye part) and absolutely stunning. Matthew had several other impacts on our evening which were slightly less amazing. The dust kicked up was blowing so hard that it was rubbing our legs raw. Attempting to boil water to eat required putting the stove (a pocket rocket) into the lee of a large tree and for the three of us to huddle into a wind wall. We made the somewhat foolhardy decision to camp on the shoulder of Siler instead of going down into one of the sheltered coves and thus had to cover the one of us on the wind side with wind breaker jackets as the wind cut right through both the rain fly and side wall of our ultralight tent. I truly feel sorry for the scouts who decided to camp at the summit in a line of one man bivies. Morning gave us a beautiful sunrise and a troop of boyscouts sleepily trudging past. However, they were stoic in their misery, so I must praise their grit. The day was getting on and we rousted with an alacrity the scouts lacked. Our system works for us. I start breakfast (coffee first!) and while the ladies sip coffee and start to break camp, I cook. When breakfast is ready they eat while I stuff our packs, then we situate our packs and set out. Matthew had finished his run and the morning was brisk and wonderful with the very slight breezy chill that makes for a comfortable not-too-cold, not-too-hot hike. Racing down the mountain with the morning vigor of a happy hike in great weather, we emerged into Winding Stair Gap before 10am. And all was indeed, just fine. The Siler Bald trail, as with most of the southern AT, is very easy to follow with regular white blazes. Water is plentiful, even on a dry year. 2016 was a severe draught for the southeast, yet we had no trouble finding water. Your last water is off on the blue blazed trail to the shelter. If you are camping on the bald or the fields below you will want to stock up as it is a good trek and not one you're like to enjoy four times over. The last climb is a doozy and when not camping at the top we have never suffered loss/theft from leaving our packs at the bottom. YMMV, do what makes you most comfortable. Avoid the trail to Siler Bald during early AT Season from February to May as during this time it will be swarming with NOBO Appalachian Trail thru hikers.